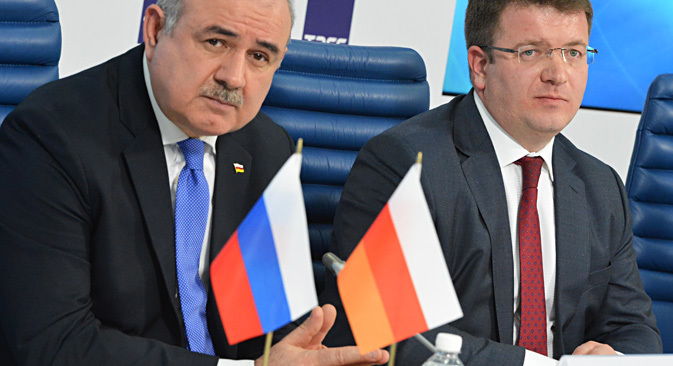 The newspaper Nezavisimaya Gazeta (NG) reports that the signing of the Treaty on Alliance and Integration between Russia and South Ossetia has been postponed. Additionally, the parliament of South Ossetia will consider a vote of no confidence against the Republic's Foreign Minister David Sanakoyev, who independently initiated the publication of the draft agreement in the local media. Alexei Martynov, the head of the International Institute for New States, told NG that it was easy to postpone the vote since the agreement hadn’t generated much interest in South Ossetia, which broke away from Georgia during the 2008 Five-Day War between Russia and Georgia. "The preparation of a new Russian-South Ossetian agreement is irrational. The relations between Moscow and Tskhinvali were perfectly regulated by the 2008 primary agreement. It was augmented by a mass of intergovernmental agreements. The signing of the new agreement, which, in fact, does not change anything in relations between the two countries means that these intergovernmental agreements should be signed once again," Martynov said. In 1970, novelist Vladimir Nabokov agreed to give an interview to Nurit Beretsky, a journalist with Israel’s biggest daily newspaper Maariv, where it was published in Hebrew. Since that time, the interview has been held in the writer's archive at the Berg Collection in the New York Public Library. It was first published in English by the Nabokov Online Journal last month. Subsequently, Nabokov Journal editor-in-chief Yury Leving gave the interview to Meduza, which has published it for the first time in Russian. Meduza also published the English version. Additionally, the site posted a conversation with Yury Leving and Nurit Beretsky, which took place in 2014. In the conversation, Beretsky shared with Leving her memoirs of her meeting with Nabokov and his wife Vera in Montreux, Switzerland. The U.S. has once again expanded sanctions against Russia, according to news site Gazeta.ru, however the bulk of those affected are pro-Russian separatists in Ukraine. The Russians added to the black list include essayist Alexander Dugin, the head of the Ministry of Internal Affairs of the Republic of Crimea Sergei Abisov, and the head of the Russian Migration Service in Sevastopol Oleg Kozhura. The Russian National Commercial Bank, which was the first Russian bank to open branches in Crimea following the absorption of the peninsula by Russia, was also hit with sanctions. In addition, the list includes former Ukrainian Prime Minister Mykola Azarov and a number of representatives of the self-proclaimed republics in eastern Ukraine. According to Gazeta.ru, the most recent U.S. move is more a symbolic gesture to demonstrate that it is still paying attention to the conflict in Ukraine and Russia's role in it. Fyodor Voitolovsky, deputy director of the Institute of World Economy and International relations, said in comments to the website that the United States does not plan to either tighten sanctions or cancel them. "However, if Washington decides that it is not satisfied with the peace process, the administration will always have such an opportunity, especially since the Congress is dominated by supporters of strengthening sanctions," Voitolovsky said. Reporting from the 10th forum of the Shanghai Cooperation Organization, taking place in the Siberian city of Khanty-Mansiysk, the Kommersant daily notes that the participating countries have agreed on matters of security and humanitarian cooperation, but have failed to make "sufficient progress" in trade and economic cooperation. "There are a lot of obstacles concerning the protection of markets, national legislations and the process of harmonization," Anatoly Torkunov, the rector of the Moscow State Institute of International Relations (MGIMO) and the head of the Russian delegation to the meeting, told Kommersant. The main purpose of the forum was to work towards a draft of the Strategy of the SCO to 2025. The draft strategy is scheduled to be presented at the organization’s summit, which will take place in Ufa in early July. The main event of the upcoming summit is expected to be the SCO’s expansion to include India and Pakistan, although China remains wary of India’s participation. "China considers the SCO a Chinese, or at least, Sino-Russian project, and from Beijing's standpoint, the induction of India threatens to blur the leading role of Beijing," said Alexander Lukin, deputy head of the Russian delegation and director of MGIMO's Center for East Asia and SCO, "But there are no formal obstacles to this." According to experts, it may take a year to induct the two countries. As Russian oil supplies increase, Gulf states are forced to drop prices to remain competitive.